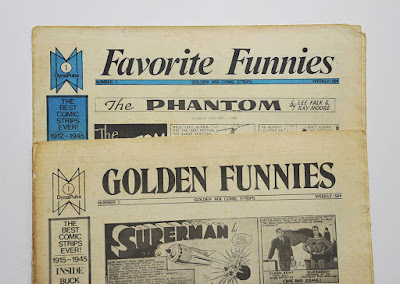 Not long ago I got this collection of Vintage Funnies pictured above. 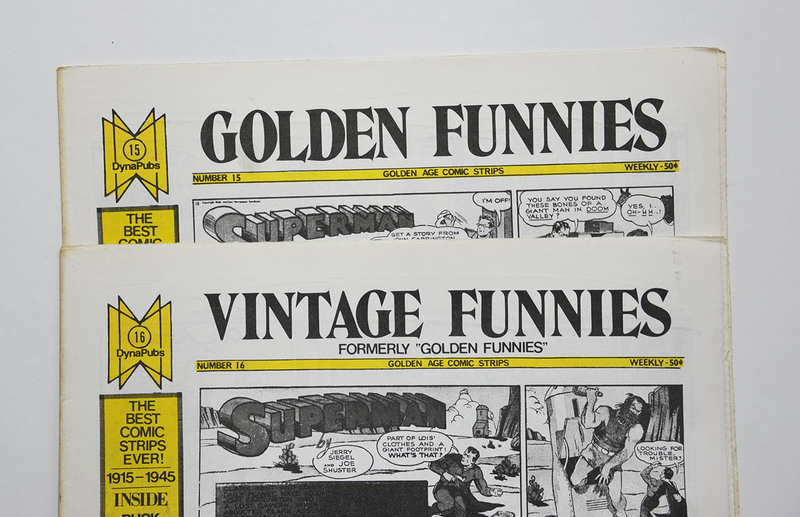 Or the lot actually consists of Favorite Funnies 1-12, Golden Funnies 1-15 and Vintage Funnies 16-60, but they are all basically the same thing. 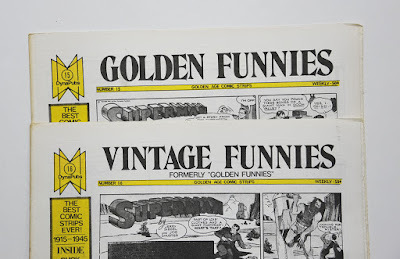 Favorite Funnies and Golden Funnies were two different series published at the same time, while Vintage Funnies is just a new name for Golden Funnies. The name changed after #15 and according to comics.org the series lasted up to #100. This newspaper sized series from the 70's reprints old newspaper comic and has everything from Superman to Krazy Kat inside. 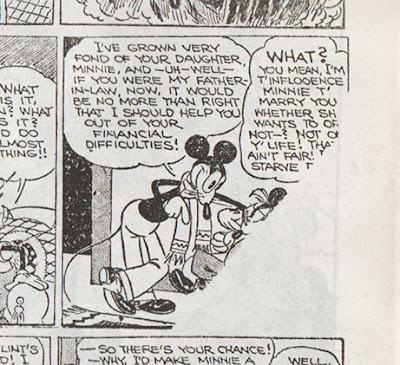 And from Vintage Funnies #29 the series also has Disney comics. 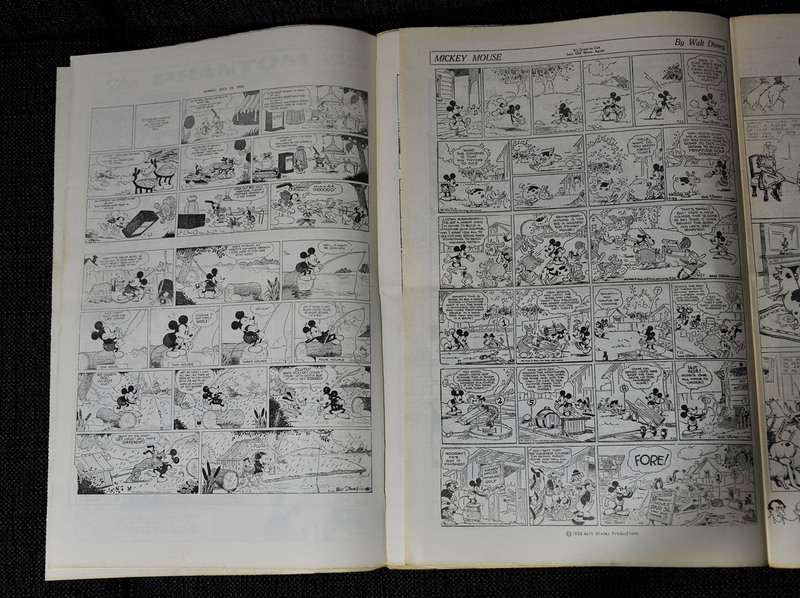 The first three issues had one page with some randomly chosen Sunday pages with Silly Symphony and Mickey Mouse. 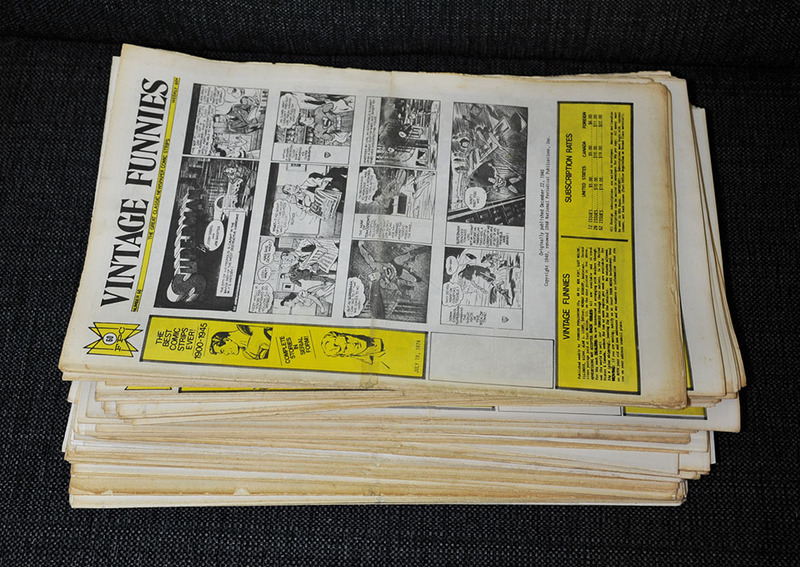 But after that Vintage Funnies started printing Mickey Mouse daily strips in chronological order, usually with 6 strips (Monday to Saturday) in each issue. The source looks like are newspaper clippings probably from private collections, so the reprint quality is not that good. From the editorial text in #29, it sounds like the plan was to reprint the Mickey Mouse daily strips from the beginning, but that didn't happen. The daily strips start in the middle of "Death Valley" with the first half of July 14th, 1930 strip as an introduction and then with the strips chronologically from July 7th, 1930 and onwards. I'm glad I got this print of the introduction strip (at least half of it) because the size is huge compared to the reprint in the Floyd Gottfredson library! There you can barely read the text. As you can see there are some strips missing in-between, and it looks like one of the source clippings had a tear. So in addition to the bad reproduction quality this is not the collection to get if you want to read a full run of the strips. For that I recommend the Floyd Gottfredson library published by Fantagraphics. When making the index I actually used the Fantagraphics book as a guide to easily spot if something was missing. And by doing that I noticed something interesting that was missing in the book too! The end caption panel in the YM 30-12-06 strip is actually missing in the Fantagraphics collection. To get the strip the same size as the rest it looks like the entire strip is scaled in width, so the proportion in the book is all wrong too compared to the original. It's easier to notice this by comparing the first two panels to the strip the day before. They should be about the same size, but as you can see in the picture above they are not in the Fantagraphics book. 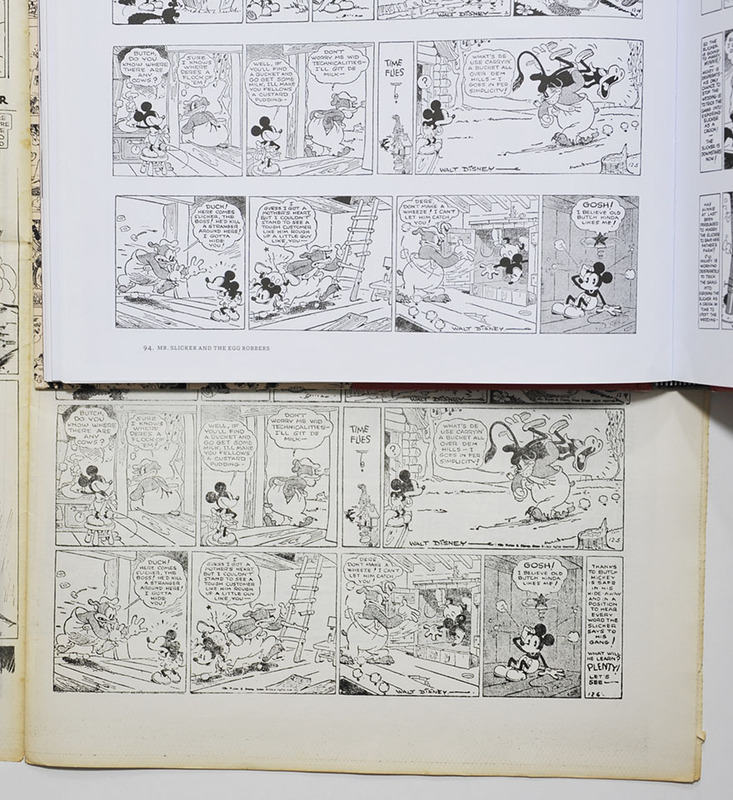 I've seen scans from the German "Comic Buch Club" edition and I have the same strip in the British Disney Mirror #149. Both have the missing caption panel, so it couldn't have been that hard to find a source with it when compiling the book. Wow! Thanks very much—you've caught an important error that somehow, nobody on our team ever spotted, myself included! Thanks to your alert, we can publish the unedited version of the strip in the final FGL volume. I just discovered this great blog series and read all of it over the past couple of days. Nice work. I'm curious as to the stopping point on the Gottfredson series. I know he continues on after the date, another 20 years or so, so does anyone know why the set stopping after only 12 volumes? Will we see any of the later stuff and will we get any more color Sundays? Did something change after volume 12 that would preclude not printing those? I'd love to have the whole set similar to Barks and Rosa or Schultz's Peanuts. 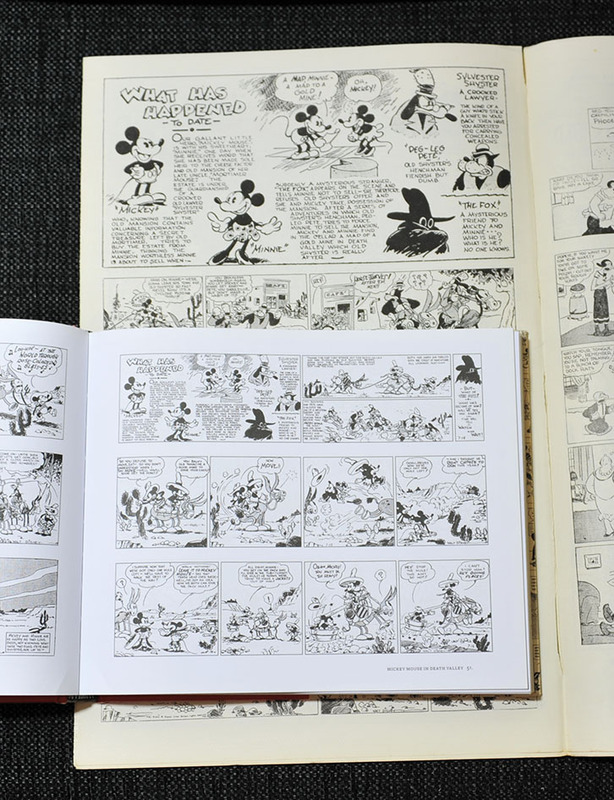 The big difference is that Gottfredson drew gag-a-day strips only from 1955 onwards, on the request of King Features and the current boss of the Disney comic strip department. So we'll get no more adventure serials from that point on (no stories at all, really), and the Mickey gag strips from the -50s to -70s aren't very highly regarded -- certainly not compared to the earlier serials. So I can understand why we're not getting another 10 volumes in the book series filled with nothing but gag strips.